After experiencing only their second .500 or worse week so far this season, the #10 Louisville Cardinals (22-6, 9-3) responded in the best way they could. 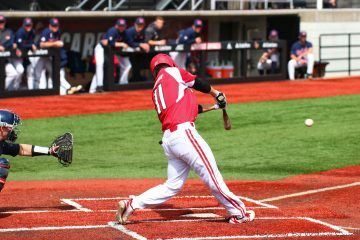 This past week, they defeated the Miami (OH) Redhawks (21-5) at their own game in the midweek affair, then followed that up with a three game sweep of the Wake Forest Demon Deacons (15-14, 5-7) to go 4-0 on the week. At the midway point of the season and heading into a heated rivalry matchup, things could not be much brighter for Louisville. The pitching staff is still a top 10 unit in all of collegiate baseball, and the offense from top to bottom is starting to really shape together. 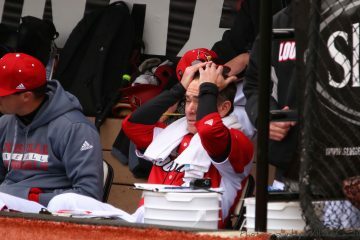 Of Louisville’s 16 pitchers toes action this season: 13 have an ERA of 4.10 or below, 11 have a WHIP below 1.20, 10 have an opponent’s batting average of below .200, 5 have 20 or more strikeouts and only 2 have surrendered double digits walks. On top of that, seemingly every hitter on the roster is getting their fair share of production at the plate. In this past weekend’s series against Wake Forest, All-American Logan Wyatt appears to have broken his prolonged slump with a 4-11 (.364), 2 HR weekend against the Demon Deacons. 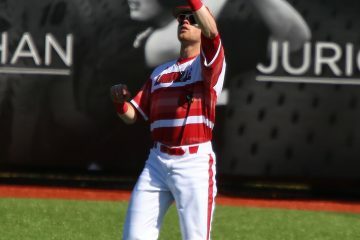 There are also some hot streaks going on amongst the hitters, with third baseman Justin Lavey batting .429 in his last 6 games, outfielder Trey Leonard batting .300 with 4 stolen bases in his last 7 games, and catcher Henry Davis batting .375 with 2 home runs and 7 RBIs in his last 8 games. The second half of the season will not be any easier for Louisville though. Out of their 13 remaining opponents, 8 of them rank in the RPI top 100 and 3 are in the RPI top 20 (Clemson, NC State, Vanderbilt). While the Cards had a winning record in the first half of the season against RPI top 100 teams (9-6), they will need to continue to play as a team like they did this past week if they are to make a serious run in the latter half of the regular season and into the postseason. And it all starts with that team down the road. 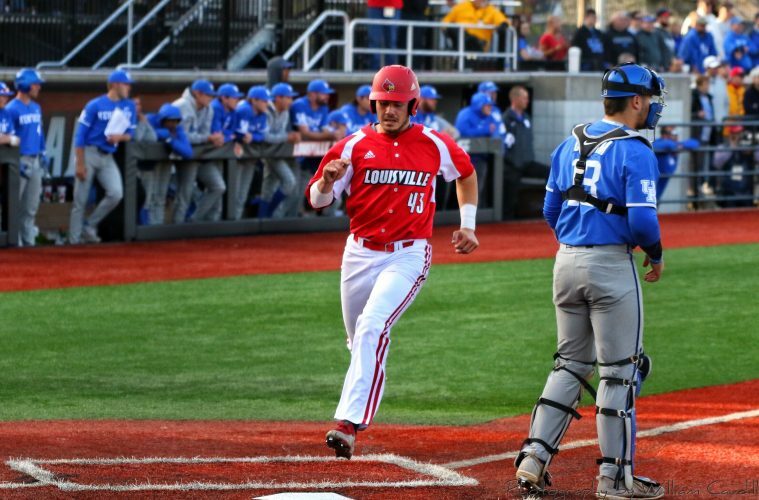 Coming up this week, Louisville will take on the Kentucky Wildcats (16-12) in the home version of the Battle of the Bluegrass for the midweek game, then follow that up with a road conference weekend series against the Clemson Tigers (22-6, 9-3). Louisville remains at the #10 spot in the polls (D1Baseball). Louisville is one game behind NC State in the ACC Atlantic Division standings. 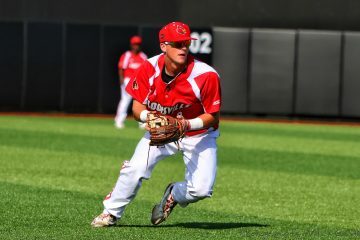 Louisville is 17th in the nation in stolen bases (56) and 39th in fielding percentage (.977%). Nationally, sophomore left-hander Reid Detmers is ranked 12th in ERA, 9th in hits allowed per 9, 2nd in strikeouts, 12th in strikeout-to-walk ratio, and 2nd in WHIP. Junior first baseman Logan Wyatt is 3rd in walks and 64th in on base percentage. Louisville will start the week at home for the midweek game, then go on the road for a normal slate of Friday/Saturday/Sunday games. Saturday’s game will be played at 5pm instead of the normal midday start. Adjusting the ticketed entry plan first featured last season, 17 of this season’s 34 home games will revert back to free entry. This week, the game against Kentucky will be ticketed entry. Tickets can be purchased here. In case you cannot make it to any of the games, all 4 games this week will be televised on ACC Network Extra and broadcast on 93.9 The Ville. Statistically speaking from an offensive standpoint, the Kentucky Wildcats are a lot more similar to Louisville than one would think. Hits, runs, and batting average all all around the same ballpark, pun intended. The top of UK’s lineup has some very consistent hitters, whereas Kentucky seems to have a much tougher time going deciding the bottom half of the lineup. However where Kentucky differs from Louisville is that the Cats have a much better power hitting squad. The meat of their order is full of players who can absolutely clobber the baseball. First baseman TJ Collett, infielder Breydon Daniel and outfielder Ryan Shinn all have 6 or more home runs, with Shinn having a whopping 13 doubles and .641 slugging percentage to boot. On top of being a long ball threat, Breydan Daniel is also a threat to steal, as he leads the Cats in swiped bags with 14 (3rd in SEC). With walks more evenly distributed amongst the team than how it is with Louisville, Kentucky has massive potential to launch multi-run home runs at will. If midweek starter Luke Smith and the rest of the relief staff can overcome the top-heavy Kentucky lineup, they should be able to have an effective day on the mound. Where the similarities end between Louisville and Kentucky is the pitching staff. UK has the worst team ERA and WHIP in the SEC, and their best pitcher in Zack Thompson would not see action against the Cardinals due to his status as Kentucky’s #1 starter in the rotation. Sophomore southpaw Mason Hazelwood, the Wildcats’ go-to midweek starter has a slight advantage over Louisville midweek starter Luke Smith as his ERA is lower, but outside of that they are pretty similar statistically speaking. One it becomes a bullpen game though, Kentucky has the clear disadvantage. Cole Daniels, Trip Lockhart and Cole Ayers are the lone UK relievers with a sub-2.70 ERA, with the rest of the UK relievers having a 3.90 ERA or worse. The key for the hitters in this game will be to be aggressive early in hopes of chasing Hazelwood out of the contest early and feasting on the bullpen arms of the Cats. It will be an extremely lofty task to go on the road to South Carolina and beat the Tigers in front of the raucous Clemson faithful. 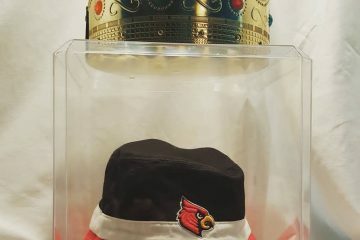 Since their road series against Duke featured a more Cardinal-friendly crowd with the Blue Devils’ basketball team playing in the postseason that weekend, this trip will truly be Louisville’s first true road test of the season. Statistically Clemson’s offense is not that much different from Kentucky’s, but it is a lot more well balanced. 6 of their regular starters are batting north of .300, with a couple regular pinch hitters/substitutes doing the same. 6 players have registered 3 or more home runs with the same number of players tallying 5 or more doubles. In this well-balanced offense, three players stand out above the rest. Infielder Grayson Byrd, shortstop Logan Davidson and outfielder Bryce Teodosio all have 20+ RBIs and a slugging percentage of .530+, with the latter two launching 7 and 8 home runs respectively. Byrd also leads the Tigers in hits, doubles, and is second in total bases. Collectively, these Tigers hitters will be tough for the pitching staff to deal with, even for a star ace like Reid Detmers. Louisville might have the best pitching staff in the ACC, but Clemson is certainly in the top 3. Their weekend rotation is nearly as good as Louisville’s, with right-hander Davis Sharpe and left-handers Mat Clark & Keyshawn Askew combining for a strikeout-to-walk ratio of 102-29 and only 26 earned runs over 105.1 innings pitched for an ERA of 2.22. Sharpe is without a doubt the best in the rotation, as he is putting up Reid Detmers-like numbers (50 strikeouts, 1.59 ERA over 39.2 IP) and is holding opposing batters to just .187 at the plate. While collectively Clemson has a bullpen that is a bit better than that of Kentucky’s, Clemson at least has a pair of go-to reliable relief guys no matter the situation inherited. In a combined 37.2 innings pitched and 23 appearances, right-handers Carson Spiers and Holt Jones have a 1.43 ERA and 41 strikeouts exclusively in relief appearances. The Cardinal Nine will have to rely on every single hitter on the roster in order to have moderate success against this pitching staff. I predict that after Louisville outlasts Kentucky to take game 1 of the Battle of the Bluegrass, they will turn around and lose the series to Clemson and go 2-2 on the week.